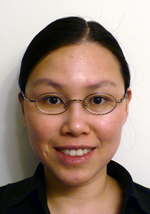 Maria Chan (NST) has been at Argonne since 2010. She began her postdoctoral research at the Center for Nanoscale Materials (CNM) and the Center for Electrical Energy Storage, an Energy Frontier Research Center (EFRC). She currently is an Assistant Nanoscientist in the Nanoscience and Technology Division. Chan received her bachelors in Physics and Applied Mathematics from the University of California, Los Angeles and her Ph.D. in Physics from the Massachusetts Institute of Technology. Her research as a postdoc focused on atomistic first principles and the modeling of energy storage materials, specifically batteries. Using quantum mechanical calculations of atomistic structural models she worked to predict and explain properties and behaviors of promising alternatives to current battery materials. As a postdoc she found that the interactions she had with collaborators greatly benefited her understanding of how different modes of research fit together. “I discovered that the key to effective collaboration understands the focus, strengths and limitations of other researchers,” says Chan. She made an effort early on to have plenty of collaborative discussions with her fellow researchers. She was excited about working at Argonne as a postdoc because of this opportunity to collaborate with a wide variety of scientists, especially experimentalists. The transition from a postdoc to a staff scientist began with Chan discussing her long term career goals with her postdoc advisors and mentors. “We discussed long-term career plans early and often,” says Chan. As soon as positions were announced, she discussed them with her mentors. She developed her letters of recommendation, talked about her research and the potential fit for different positions. Chan advises researchers to talk with a wide variety of research and administrative staff members. “Reach out! Don’t be shy!” says Chan. She has found most branches of research to be collaborative. “Argonne is an excellent place for postdocs to broaden their horizons,” says Chan. This entry was posted in Alumni News and tagged alumni, maria chan, mentoring, Nanoscience and Technology Division, staff position. Bookmark the permalink.